If you are here for the first time, we recommend the drive down from Anchorage. It offers three and a half hours of breathtaking scenery if you can resist the temptation to pull off at every turn. 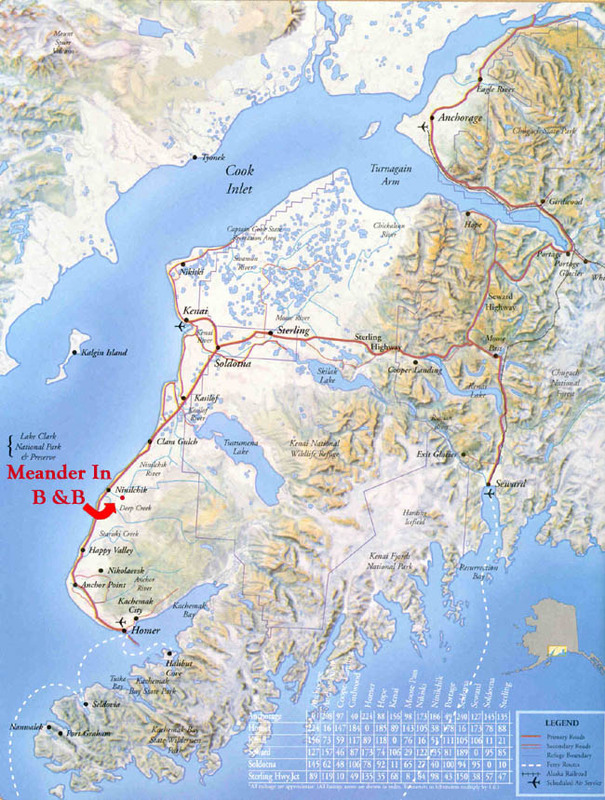 Or, you can take the short flight to Kenai, or Homer, and rent a car there. Nililchik is an hour drive from either airport. Be sure and make these plans in advance. Turn at the only gas station in town, Chinook Tesoro, onto Oilwell Road, and drive 2.6 miles alongside the winding Ninilchik river valley to Meander In B&B. we are on the ridge overlooking the entire lower river west to Cook Inlet. we know that the view from here will offer a fitting end to your spectacularly scenic drive. Welcome Home! Ninilchik is the "Heart of Recreation " on the lower peninsula. From here it is just a short distance to anywhere you want to go. It would be our pleasure to be your hosts, and share with you Alaska as we live it. Click here to see the map. Click here to see the mileage.